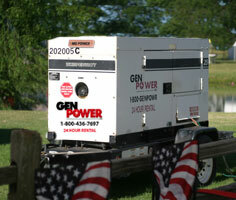 Gen Power’s 20kW generator line-up is powered by MQ Power WhisperWatt Ultra-Silent Generators. The WhisperWatt Generators offer reliability while achieving sound levels that are 11 percent quieter than others in its class. And to safeguard the environment, each WhisperWatt Generator features an integrated 24-hour fuel tank with a fluid containment system. Their dependability and quiet operation make for great sources of portable power in the construction and entertainment industries. Sound proof housing keeps operating noise levels to 59dB(A). Features a mechanical governor that maintains steady state 60 Hz within 3-5% from no load to full load. A comprehensive analog control panel provides instrumentation including AC ammeter, AC voltmeter, frequency meter, AC circuit breaker, engine gauges and much more.